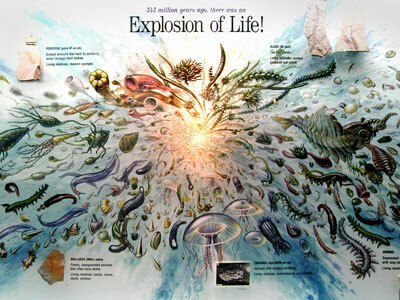 >>>The Cambrian Explosion is the supposed explosion of life in which only a few simple organisms immediately burst into a immense variety of more complex organisms. This was also a point in time when many organisms went extinct. The evidence and basis for this idea is that there are simpler fossils in the lower rock layers and in just a few layers above these there is a large variety of complex life forms fossilized in the higher Cambrian layers. Perhaps a sudden global flood caused a sudden global burial of an immense amount of life? ← How did Noah Build an Ark?